Disclaimer - While my intension was to have a well-organized page of my cf 4600 detailing projects, this page isn't there yet. I admit I was trying to do too many models at one time and got ahead of myself at times. I do plan to go back and redo this page, but I wanted to have something out there so others could see what I have done so far and how. Your patience and understanding is appreciated. I am just trying to have fun and share my modeling adventures with others. 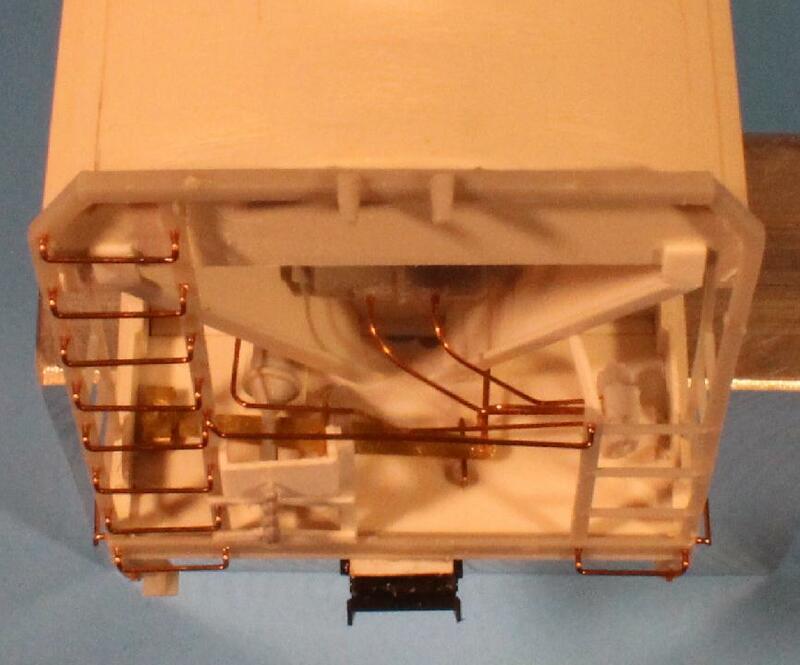 Build using Accurail undecorated kit. This model is what I consider a basic-fill-in model. 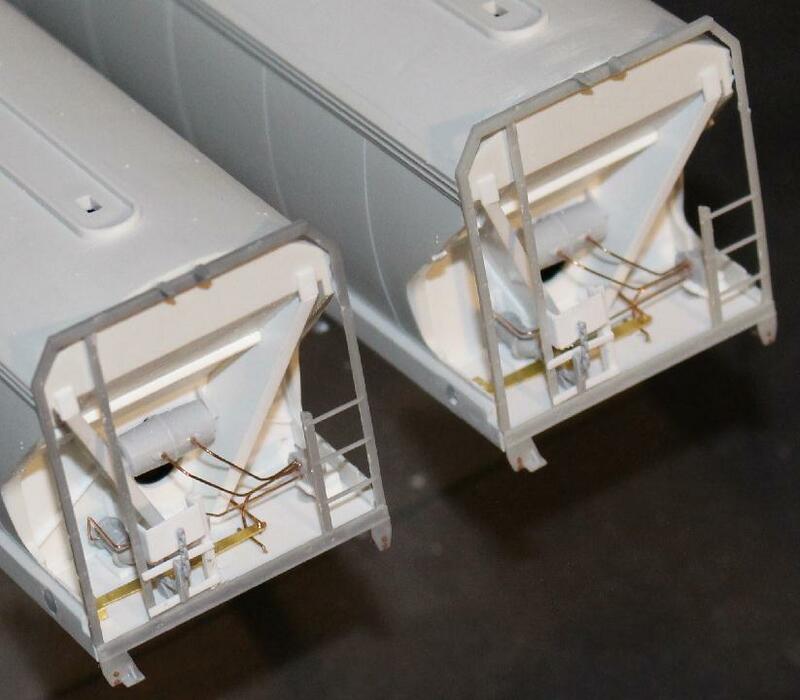 It is a nice looking model with most of the details of the 4600 but the level or quality of the detail is low compared to the newer models be produced today. I know there is a lot of demand for a newer- high quality 4600 so I would not be surprised to see one in the not too distant future. Now that I have finally started building mine, it will probably happen. Dabney's law. The thing that has probably kept a majority of modelers from detailing one of these cars is the roofwalk. While it isn't that bad of looking roofwalk, it isn't a see through metal roofwalk that is becoming a more popular feature these days. And it isn't a quick and clean removal and update. The end section over the roof is cast as a solid part of the roof. The process of carving, cutting and filing can be tedious and tiring. Bare with me as I attempt to do a step-by-step process on replacing the roofwalk and several other details. After the majority of the roofwalk is removed, just some light carving-sanding-filing is needed. I find this model to be made out of a softer plastic than some models. Not as brittle and it is easier to carve off unwanted details. I just sanded the areas needed to get continuous roof contour. I also removed the end cages as I will be replacing them with new end cages. More on that later. For now I left the bottom cross support in place just to be safe. It will be removed later. The top of the frame and the side ladders are all removed and body cleaned up. 180000 - Now seemed to be a good time to go ahead and drill all those holes for the new brass walkway supports. This car series all had Morton pattern roofwalks mounted on nine evenly spaced, same size, supports. Using a paper template I marked and drilled holes for mounting the new supports. Installing the supports will come later so I don't damage them while working in other areas of the car. As long as I am removing parts, I might as well remove the coupler boxes and the cast on brake hardware. I will be replace all of those items as well. There were a few irregularities in the floors and I filled them with strips of styrene. Removed the cast on rope pull plates, grab irons and stirrup steps from the side sills as they will all be replaced with metal parts. The cast in hand holes on the side sills were filled with pieces of plastic sprue. Opened the hole up slightly with a 1/8" drill bit and then MEK'd a round end of the sprue in place. Filed smooth after it dried. 172000 - The Accurail model appears to represent a late phase of the ACF cars. 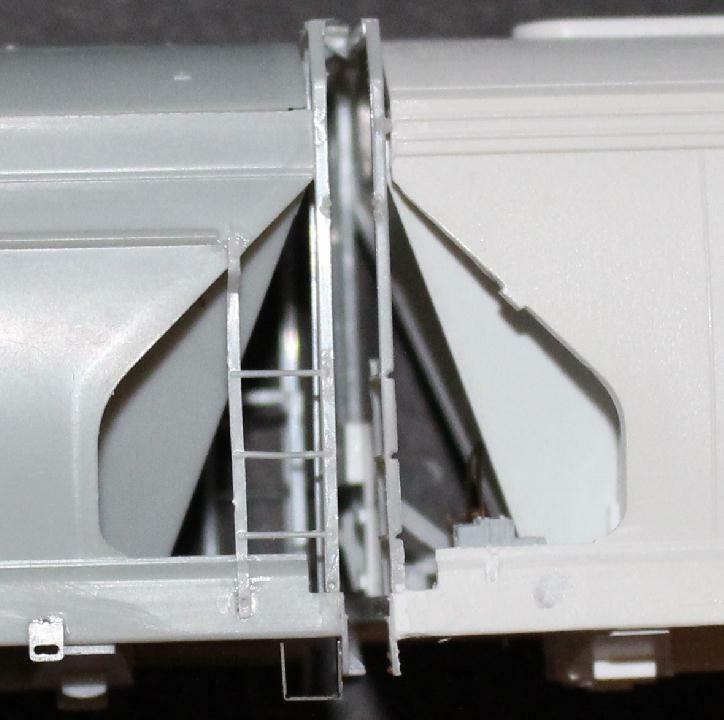 Besides the hand holes in the side sills that were a later feature, there is some sort of tab / fin / bracket on the side slope right next to where the side ladders attach to the body. The 180000 series cars are good with these but the 172000 series are not. So I sliced them off with a razor blade. With all the unwanted details removed and mostly a basic body and floor, it is time to start detailing and building the model. I started with the small easy area to work on, the end panels. Nothing to it right? Just add the air reservoir and it is done. 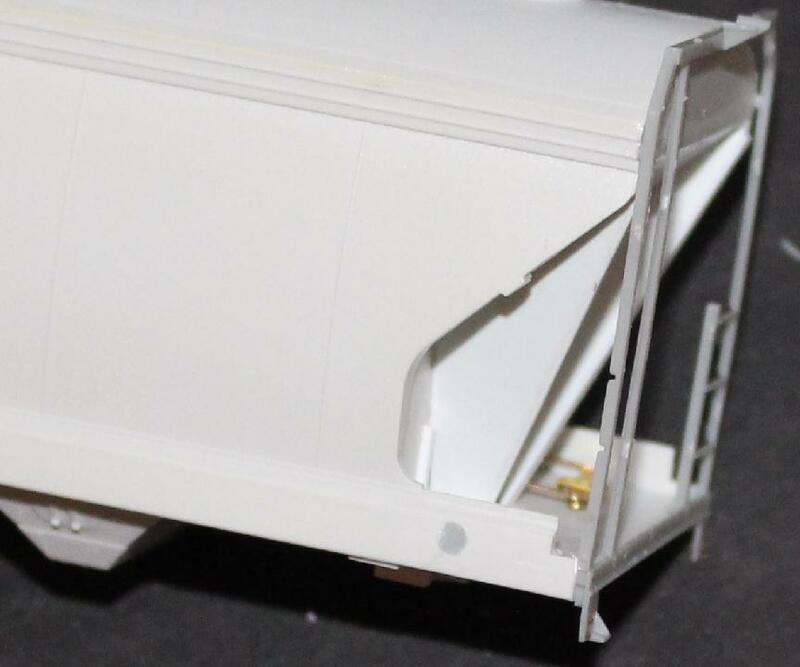 Well, I pondered rebuilding / replacing the ends with sheet styrene and end slope sheets from Athearn. The angle of the bulkhead slope is slightly different. I believe the slopes should all be 45 degrees but that doesn't mean all models are the same. I could also build end slope supports out of styrene. Oh so many decisions to make. Well, I decided to go ahead and make new end slope supports out of .020" styrene sheet. The end walls of the kit had to be sanded smooth. All of the removed details will be added back with strip styrene. New holes for locating the Tangent air reservoir should have been drilled before any new details are added. Wasn't very scientific here, just trial and error until I got something that looked about right to me. A .040 X .040 X 1.0 styrene strip was positioned on upper sloped wall. Glued the new slope sheets to the wall, giving location of cross support. Then I capped the end supports with strips of .015 X .060 styrene. 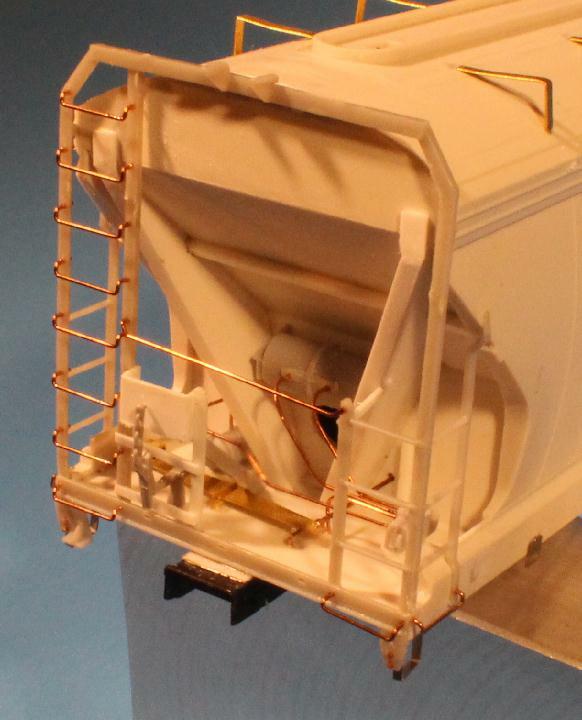 Small .100 X .100 pieces of styrene will be added to the top to represent that feature on the prototype. Short .020 X .020 strips added to the outside of the supports to represent the removed vertical braces. 172000 - The 172000 series of cars have small diagonal brackets on the end walls. Not sure the purpose of these. Not all ACF cars had these. The 180000 series did not. These are easy to add. Using .015 X .030 X .375 styrene strips, the outer end is .150 up from the floor and the inner end is up .375 from the floor. Those are my eye ball - "looks good to me" - dimensions. A new air reservoir is added to the B end wall. I used a Tangent Scale Models part from their PS 4750 detail sprue. 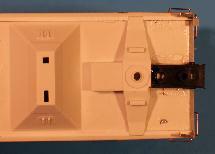 The tank is mounted with the mounting supports pointing up. 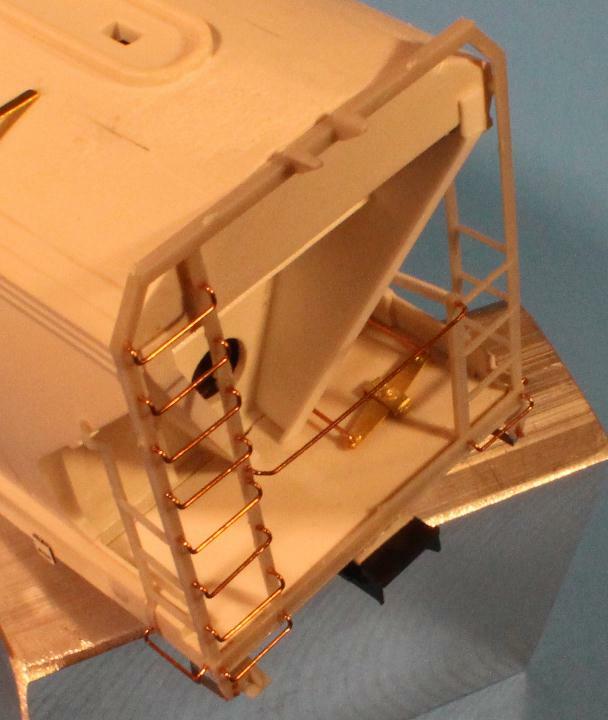 There were .020 holes in the tank for mounting their air lines. I plugged them and new .012 holes are drilled in the tank for new brass air lines. And the end walls are clued in place. Most of the end brake detail was added before gluing the floor in place. This made it easier to get to work. 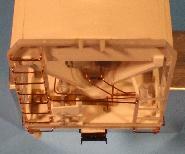 A new AB brake valve from Tangent was mounted on a U channel box made from styrene and glued in place. A new brass brake lever was added to the floor in place of the cast on lever that I removed earlier. I used this(?) photo by David Olsen as a reference of what I believe it all looks like. New .015 wire linkage will be added after the floor is attached to the body. A new brake cylinder is added to the mounting pad. On the A end there is a new brass brake lever added to the right side of the floor. New .015 wire linkage was added and fed through holes drilled in the wall after the floor is mounted to the body. With the floor attached I added the .015 wire brake linkage to the ends of the new brass brake levers on both ends of the car. All new air lines were added between the reservoir and brake valve. 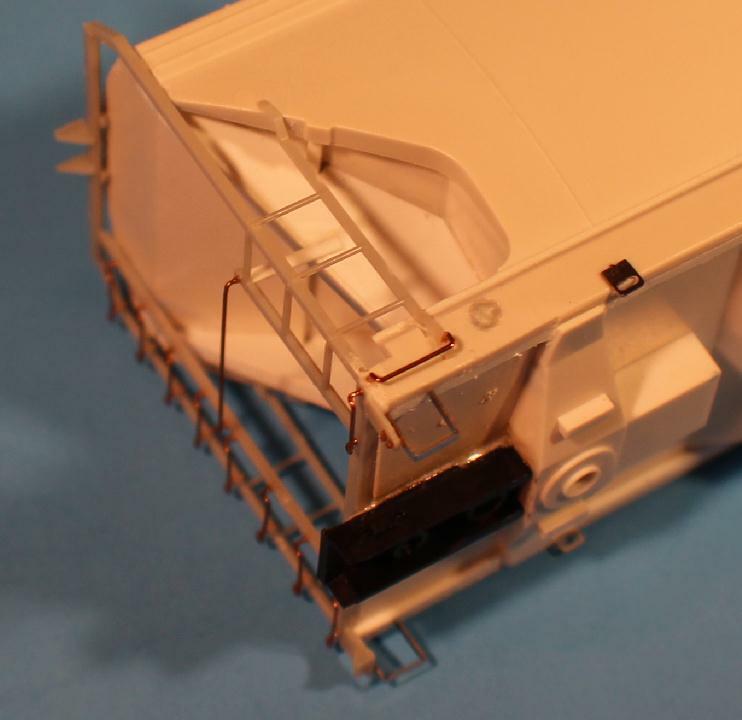 The brake cylinder will be added after the end cage is attached. Need to make sure it is positioned correctly. Time to modify and add the new end cages. 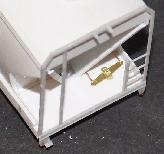 I am using the Athearn 2970 end cages 93990. Wasn't sure how well this was going to work but as I built the models and kept looking at how they could be attached, I found that they would fit pretty well. 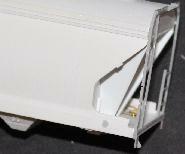 Like the cf2980 cars I am working on, the brake housing mounting is different than the Athearn 2970. I used the same process as the 2980 cars to build new brake housing mounting plates from styrene. Before I get ahead of myself here, let me do a little work on the B end frame first. The mounting plate and short upright are removed. Also, On the back side of the lower cross frame bar, I removed the long lip to allow for more of the bar to attach to the floor (and remove some of the thickness). Modified frame on right. Now I can build up the new brake housing mounting plate. A piece of .010 X .030 X .450 styrene glued to the side of a .010 X .040 X .420 styrene gives me a new angle iron upright. A piece of .015 X .156 styrene strip mounted to two .015 X.080 X .156 styrene strips was glued between the ladder and the upright giving me a plate to mount the brake housing on. A couple small strips on each side of the fulcrum for support are also added. As far as modifying the body to allow the end cages to properly fit, I trimmed the sides even with the ends of the floor. Also notice the two holes at the top of the upper end panel. These are to accept the top mounting pins of the end frame. The two upper side pins were not useable so no holes were drilled. I am using the Atlas 4650 brake cylinder assembly. To get the correct mounting location I carefully held the end cage in place and then held the cylinder up to end cage. Seeing general area to mount, I added a mounting pad of styrene. The 172000 series car is on the left. 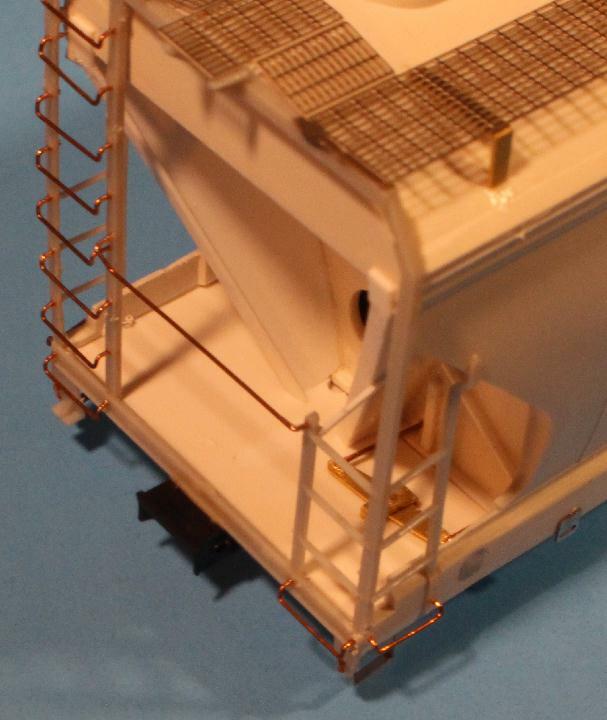 After the end cage is attached and all other piping and details are added, there is a brace from about the top of the angle iron post angled down to the deck to be added. Not really visible here but can be seen in other photos. On these cars I used a bracket from the Atlas 4650 group of parts. The 172000 car is on the left. The A end is a lot easier. Remove the lower lip on the inside of the cross bar. Drill two holes at top to hold top of end cage. Remove round mounting pins from side of cage but leave small mounting tabs as stand offs. I tweaked the lower corners of the body until I was happy with the fit and then I glued it all together. Adding the side ladders took a little more work than I thought it would. The tab on the bottom of the ladder had to be carefully removed. The top should have been mounted to the inside of the side wall, but that could not be done. The most troubling part was that the ladder set too high. Guessing around .020". Just enough that it was noticeable. Apparently the side is taller on the 4600. Rather than trying to modify the ladder, I made a very small divot in the side for the ladder to sit down into. Once glued together it all looks fine. Probably wouldn't notice if I didn't point it out. Re-referencing the photo on the left, in the lower corner where the end cage mates to the side sill, you will notice there is a small gap. I used small pieces of .010" X .030" strip to fill these voids in. Fit perfectly. Adding new draft gear coupler boxes. Using the reference material I have, the length of the car over the striker plates (coupler box face) should be around 7.648" (or 55' 5"). To find out the length I need to trim the Moloco boxes to, I measured the distance to the outer ends of the modified bolsters. That length was 6.440". Cutting two boxes to .604" each, once mounted, I was at the 7.648" needed. My .010" styrene shim was the length of the area between the car and the box, about .480", as I didn't want the shim exposed. In this photo you can see the added draft gear and the .010 shim between it and the car floor. I made all new grab irons out of .012" phos. bronze wire. Took a few attempts to get the hang of it. I am fine with the results. 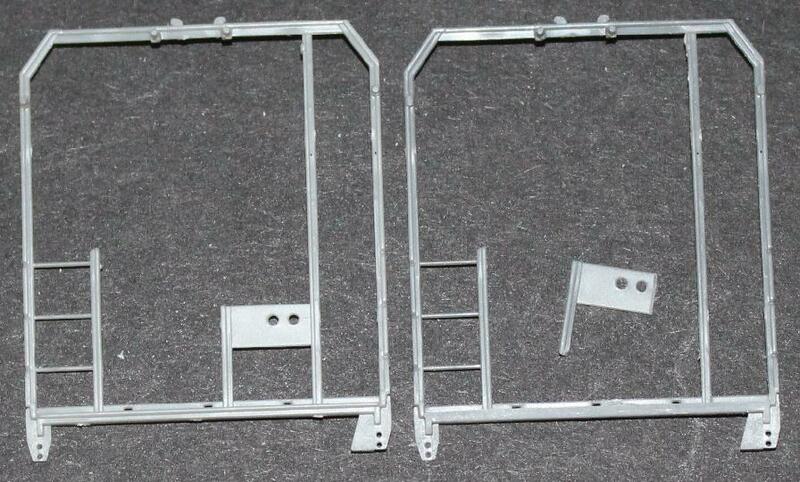 I have some of the metal grabs that Athearn supplies with the 2970 kits. Don't know what I was doing wrong but I could not get them to glue in place. The CA just wouldn't set up. These set instantly. Is there something about the CA and that metal react against each other? It was less work to make new ones then fight the metal ones. The A end with all the new grabs. Here is the B end with all the new grabs added. You can also see the brake lever and the air lines. 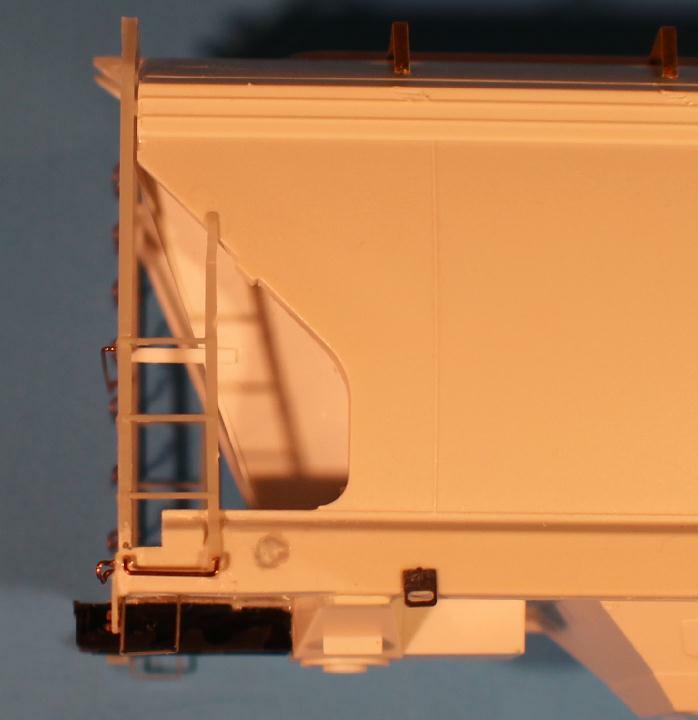 This photo shows an Apex roofwalk has been added to the 172000 series car. The car in front is the 180000 series car and will have a Morton pattern roofwalk. Therefore the supports are different, both in spacing and in size (width). Trying something new (for me) on these cars. I used JB Weld to attach the roofwalk to the supports. Should hold but will see if they pop off as time goes by. I have not decided as to what I am going to use for the roof hatches. From what I have found, the 180000 series cars might have used two different styles of hatch covers. One looks very much like the supplied cover. The other looks to have square ends and may be a replacement. 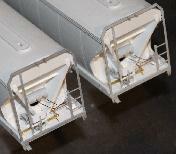 The 172000 series cars look to have a fiberglass cover with vertical raised ribs. Thanks to Ryan Harris and his builds on the rescue forum, I see the Athearn FMC 4700 hatch will work. Now If I can find a few of those. This photo may look like I am showing the new draft gear but I am actually showing you that I added .040X.040 styrene strips to the inside edge of the side sill. Why? Don't have a prototypical reason but it gave me more depth for adding the stirrup steps and new train line. Plus it helps match the 2970 and 2980 side sill bases. Finally bent and added the new train lines. For these two cars I did not drill through the bolster and feed the lines through them. Just trimmed even with bolster. I will be exploring another option on the bolster on the next build. Been draging my feet on the progress of this model. The outlet gates had me doing some research on what to use. 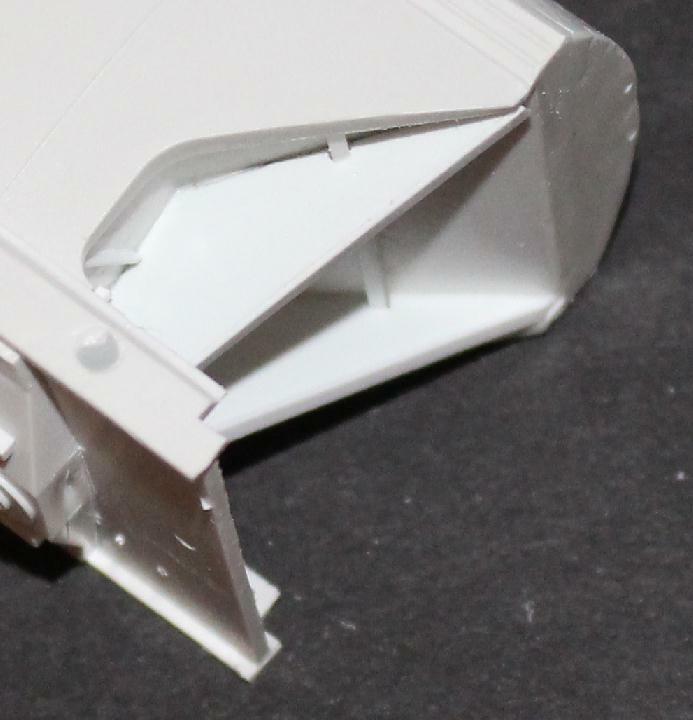 From what I could see in the photos I have, there isn't a good model hatch out there that matches the prototype hatches. 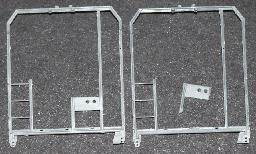 At this time it looks like I will be attempting to modify the Athearn cf2970 outlet gates to resemble the ACF 5124 gates. May have to modify the car bays also.